Turmeric (Curcuma longa)  , a member of the Ginger family, has long been a staple of Indian cuisine. Without it, Indian curries would lack their distinctive flavour and characteristic yellow colour. Turmeric has featured prominently in Ayurvedic (Traditional Indian) and Chinese systems of medicine. The major active constituent in Turmeric is curcumin which has been shown to have a wide range of potent antioxidant and other therapeutic actions (alterative, analgesic, antibacterial, anti-inflammatory, antitumor, anti-allergic, antioxidant, antiseptic, antispasmodic, stomachic, astringent, cardiotonic, carmitive, cholagogue, digestive, diuretic, stimulant and vulnerary to name a few). What does this powerful antioxidant do? Oxidation can be compared to rust on an automobile, where an antioxidant can be likened to the paint that protects the vehicle from rust damage. In the body, oxidation causes free radicals to form and free radicals damage cells and form toxic cells which can lead to disease. Many researchers attribute much of the ageing process to the incessant damage caused by free radicals and the subsequent decline in the body's ability to effectively regenerate damaged cells. Antioxidant nutrients protect cells from free radical damage. The most publicised antioxidants are vitamins C and E, beta carotene and zinc. However, new research is uncovering herbal antioxidants that have the same, if not more, power. Turmeric (Curcuma longa) is one of those powerful, antioxidant herbs and has been found to be over five times more potent than Vitamin E at quenching a wide range of free radicals. It also reduces inflammation by lowering histamine levels and possibly by increasing production of natural cortisone by the adrenal glands. In human studies Turmeric has been found to equal and in many cases exceed, the benefits associated with both cortisone and phenylbutazone treatment. Additionally, clinical trials of persons suffering from rheumatoid arthritis showed a signific improvement after six weeks at a dosage of 1200mg per day. It may also benefit people with osteoarthritis. Turmeric has been shown to reduce pain in post herpetic neuralgia and arthritis, as it blocks the formation of Substance P, a neurotransmitter of pain. Other studies have focused on Turmeric's benefits to the cardiovascular system, it has been shown to reduce blood platelets clumping together, which in turn improves circulation and helps prevent atherosclerosis. Turmeric appears to lower cholesterol. It may also help defend against blood clots that trigger heart attacks and some strokes. A live trial (using mice) has demonstrated that curcumin significantly reduced the degerneration of brain celss caused by exposure to fluoride. Researchers showed Turmeric protects the liver from a number of toxic compounds and enhances gall bladder function. They concluded that one of Turmeric's medicinal effects is to induce contraction of the gall bladder, helping it to expel beneficial bile into the duodenum (small intestine), activating certain enzymes, aiding metabolism of fats and the absorption of fat soluble vitamins A, D and K. Studies have also found Turmeric to be helpful for people with indigestion. Preliminary studies indicate Turmeric could be useful to AIDS patients. Specifically, it may reduce the HIV viral load. In fact, curcumin appears to be active against acutely and chronically HIV infected cells. According to researchers at Leicester University Turmeric may stop cancer tumours forming. Curcumin the active ingredient is thought to interfere with certain enzymes that help trigger uncontrolled cell division. A study published in the journal Phytotherapy Research has confirmed for the first time in a randomized, controlled clinical trial that the primary polyphenol in turmeric known as curcumin is both safe and effective in treating serious states of depression. Perhaps more significant is that the study is the first which shows that curcumin may be used as an effective and safe modality for treatment in patients with Major Depressive Disorder without concurrent suicidal ideation or other psychotic disorders such as are linked to prozac and other pharmaceutical antidepressants. With such a long history of usage in Asia it is no wonder that Turmeric is a popular subject for study in pharmaceutical research. You only have to check the array of clinical trials  (76 in April, 2013) to see how enthusiastically this plant is being examined for exploitation. The good news is that you can use it yourself without waiting for lengthy, expensive research, approval and manufacturing delays! Contra-indications: Turmeric is considered safe for most adults. High doses or long-term use of turmeric may cause indigestion, nausea, or diarrhea. 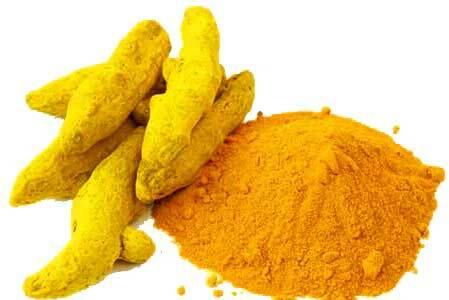 People with gallbladder disease should avoid using turmeric as a dietary supplement, as it may worsen the condition  . 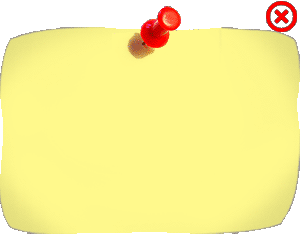 However there is more - here are other actions attributed to the constituents found in Turmeric - Curcuma Longa. Of course not all of these are considered major actions of Turmeric - Curcuma Longa, however the list does demonstrate just how comprehensive Turmeric - Curcuma Longa’s health maintaining abilities are. Is it Safe for me to take Turmeric - Curcuma Longa Tincture? If you are in any doubt about the possibility Turmeric tincture causing complications with prescription drugs or a medical condition you may have please get in touch so that we can advise you on the suitability of a particular tincture. There are fewer concerns when using Turmeric tincture externally and our many years of experience has shown that the tincture is just as effective being applied into the soles of the feet or applied topically on external conditions where they will be absorbed into your system. 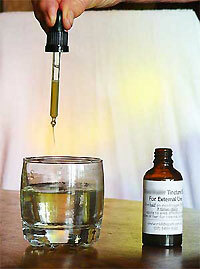 Turmeric tincture is a potent liquid extract made from organic Turmeric. It is a concentrated way of getting herbal medicine into your body easily especially applying them to the soles of your feet. Once a tincture is prepared, it has an extremely long shelf life. Tinctures should be kept in a cool, dark cupboard to maintain their potency. If you are on any prescribed medication we strongly advise you to use our free Herbal Tincture enquiry service to make sure that the medication and potent Turmeric tincture are compatible. 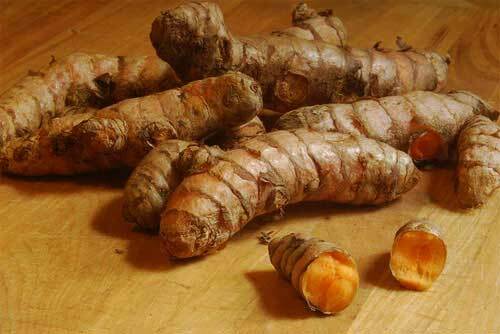 How do I prepare my Turmeric Tincture? When should I drink my Turmeric Tincture? Turmeric (Curcuma longa) has been used for 4,000 years to treat a variety of conditions  . 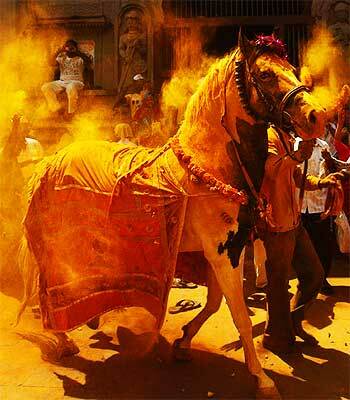 Turmeric has been grown in India since ancient times. It reached China by 700 AD, East Africa by 800 AD and West Africa by 1200. It was introduced to Jamaica in the 18th Century. Today, turmeric is widely cultivated throughout the tropics  . Because turmeric root plays such a crucial role in maintaining a balanced, healthy body, Ayurveda believes its use ultimately leads to a calm, peaceful mind, radiant vitality and greater longevity. Turmeric is a sterile plant, and does not produce seed. It is thought to have arisen by selection and vegetative propagation of a hybrid between the wild turmeric (Curcuma aromatica), native to India, Sri Lanka and the eastern Himalayas and some other closely related species. 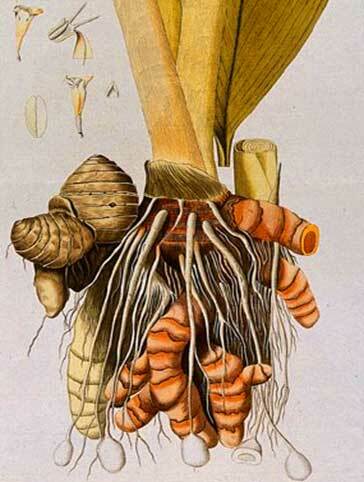 Plant turmeric in September or October, into a warm soil. The rhizomes should be planted 5-7 cm deep. It is often planted on ridges, usually about 30-45 cm apart and with 15-30 cm between plants. The crop is planted by setts (small rhizomes) with one or two buds. Approximately 1,700 kg of setts are required to one hectare. 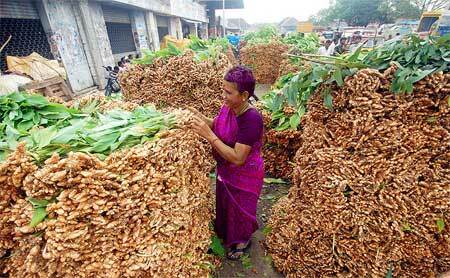 Expected yield would be 13 to 35 tonnes/ha of fresh turmeric. 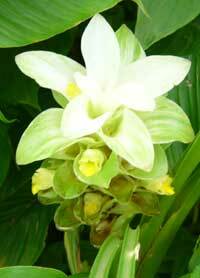 In cooler areas of Australia turmeric can be grown in glasshouses. 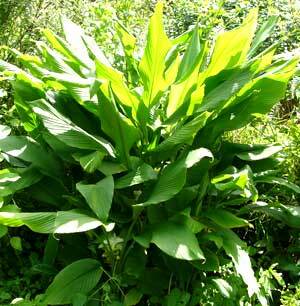 Like all herbaceous perennials clumps of turmeric need to be broken up and fresh pieces planted every 3 to 4 years. Turmeric is one the most thoroughly researched plants in existence today. Its medicinal properties and components (primarily curcumin) have been the subject of over 5600 peer-reviewed and published biomedical studies. greenmedinfo.com's five-year long research project on this sacred plant has revealed over 600 potential preventive and therapeutic applications, as well as 175 distinct beneficial physiological effects. This entire database of 1,585 ncbi-hyperlinked turmeric abstracts can be downloaded as a PDF at greenmedinfo.com's Downloadable Turmeric Document page. Given the sheer density of research performed on this remarkable spice, it is no wonder that a growing number of studies have concluded that it compares favorably to a variety of conventional medications, including: Lipitor/Atorvastatin(cholesterol medication), Corticosteroids (steroid medications), Prozac/Fluoxetine, Aspirin (blood thinner), Anti-inflammatory Drugs, Oxaliplatin (chemotherapy drug), Metformin (diabetes drug) to name a few. We have identified 27 studies on curcumin's ability to either induce cell death or sensitize multi-drug resistant cancer cell lines to conventional treatment. NCBI Efficacy and Safety of Curcumin in Major Depressive Disorder: A Randomized Controlled Trial.